When I set up my copywriting business back in the ’90s, I was frustrated by how much I was able to charge to write a press release. Despite its high value — remember, press releases actually worked back then — the most I could get was about $400. And some clients wanted to pay far less than that. Whatever the reasons, it was a low-paying gig. There was no point in fighting it. No amount of convincing would get clients to value these workhorses of public relations any more than they did. It was just the way it was. So I did what any self-respecting freelancer would do. I focused on other types of projects that paid much better: direct mail, ads, annual reports, and articles. Today, the world of copywriting has changed. (To put it mildly!) What paid well a few years ago in some cases pays peanuts today. And a new slate of copywriting projects has emerged where the fees range from professionally-respectable to very high. So what are those new darlings of copywriting? Here’s my list. Website writing has been a roller-coaster ride. First, it paid well. Then, it didn’t. Now companies are willing to invest in good website writing again. Why? I suspect it’s because so many companies are upgrading to responsive design and, as a result, taking a closer look at their websites. They want better branding and storytelling; more compelling messaging; and more leads, enquiries and conversions. 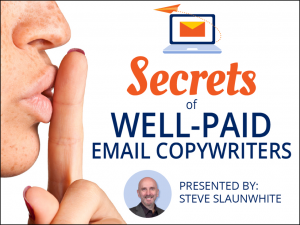 Word for word, email copywriting is one of the best-paying specialities these days. And for good reason. Companies are constantly looking for ways to get better results with their e-newsletters, follow-up emails and email marketing campaigns. Any writer who can help them do that will be in high demand. There are so many of these things on the internet, you’d think they don’t work anymore. But they do. A great white paper, for example, can build thought-leadership, position a company as go-to experts and innovators, generate leads, get publicity, spur sales, and more. That’s why so many companies are willing to invest serious dollars in this content. These are web pages designed to make a sale. If it has a Buy Now button or similar call-to-action, it’s a sales page. This type of project pays well for an obvious reason. The better it’s written, the more leads, sales, registrations, sign-ups, etc. a company gets. Anytime you can write copy that makes money for a client, you can charge accordingly. You could argue that naming isn’t copywriting. But I disagree. I think anything that involves coming up with the right marketing/selling words is copywriting. Even if it’s just one word. I’ve developed numerous product names, and even new business names, for clients. These are fun projects, but a lot more work than you might think. It takes hours of strategizing, brainstorming, and long walks hoping for lightening to strike to come up with a terrific, brand-worthy name. So that’s my list. Did I miss anything? Probably. If you’d like to add your two cents to this list, I’d love to hear from you. You can use the comment section below. So this is your new brand, eh? Looks great. How about case studies for the list? They are, after all, in the top 3 content favoured by marketers. I was on the fence about case studies. They pay well, but they’re also a lot of work. I’d say they come a close sixth on my list. You are right about the above…I have one to add – Images (with branding and text and a Call to Action – all in a few words) for Ads online whether it be Facebook Ads, Google Ads or Social Media posts. Can be a real challenge! In the past year I’ve been getting more inquiries for landing pages. So have I, but I call them sales pages. Whatever you call it, any web page that is written to persuade someone to make a buying decision (download a white paper, sign-up for a webinar, request a demo, subscribe, buy, etc.) is a sales page. There is little money in writing landing pages that generate leads like offering a free white paper. There is a ton of money to be made in writing landing pages that make a direct sale via credit card or PayPal. There is little money in writing e-books to be sold as info products by small online marketers like me or even bigger ones. There is a lot of money to be made writing white papers used as lead magnets by companies selling technology to IT professionals. I agree, Bob. Writing landing pages that sell something (I call them sales pages) pays well simply because you’re helping the client make money. And, more importantly, the client SEES that your advice and copy is making them money. As for white papers, they pay well because they’re tough to write, yet necessary for lead-gen campaigns for tech companies. Tech companies rarely have the resources in-house to write a winning white paper, and their advertising agencies sure don’t know how do it. So the advantage, and the good fees, go to the freelancers. Love articles like this, thanks Steve. So concrete, actionable. Having written white papers and case studies, my experience has been that case studies are easier to write as they include fewer interviews and often fewer reviewers. Also, don’t companies use more case studies than they do white papers (or ebooks), that is, doesn’t one white paper last awhile so, as a freelancer, you’re more likely to get more initially and more ongoing work for case studies versus white papers? Can you say why white papers/ebooks are on your list but case studies didn’t quite make it?